Craig Davies hit a second-half hat-trick as Preston romped to victory over Carlisle, who fell back into the League One relegation zone. Stuart Beavon headed Preston in front and Alan Browne tapped in for 2-0, with Gary Madine replying for Carlisle with a header before half-time. Lee Holmes restored the two-goal lead before Davies scrambled in the fourth and tapped in to make it 5-1. Davies then completed his hat-trick with a thumping finish. 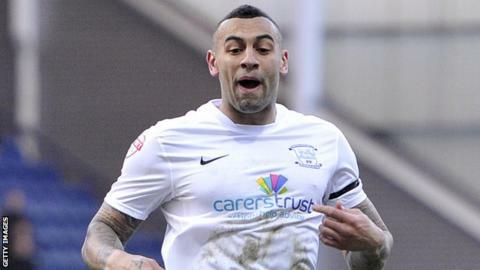 The result means Preston have consolidated a play-off place, but they are eight points behind second-placed Brentford. Carlisle slip into the relegation zone on goal difference. Match ends, Preston North End 6, Carlisle United 1. Second Half ends, Preston North End 6, Carlisle United 1. Attempt missed. Craig Davies (Preston North End) right footed shot from the left side of the box is too high. Corner, Preston North End. Conceded by Chris Chantler. Josh Brownhill (Preston North End) wins a free kick in the attacking half. Matty Robson (Carlisle United) wins a free kick in the defensive half. Attempt missed. Kevin Davies (Preston North End) header from the right side of the box is close, but misses to the right. Substitution, Preston North End. Paul Huntington replaces Tom Clarke. Goal! Preston North End 6, Carlisle United 1. Craig Davies (Preston North End) right footed shot from outside the box to the bottom left corner. Gary Madine (Carlisle United) wins a free kick in the defensive half. Goal! Preston North End 5, Carlisle United 1. Craig Davies (Preston North End) right footed shot from very close range to the bottom left corner. Attempt saved. Josh Brownhill (Preston North End) right footed shot from the right side of the box is saved in the centre of the goal. Attempt saved. Paul Gallagher (Preston North End) right footed shot from outside the box is saved in the bottom left corner. Corner, Preston North End. Conceded by David Amoo. Attempt missed. Tom Clarke (Preston North End) header from the centre of the box is just a bit too high. Substitution, Preston North End. Kevin Davies replaces Stuart Beavon. Corner, Preston North End. Conceded by David Symington. Substitution, Carlisle United. Lee Miller replaces Daniel Redmond. David Symington (Carlisle United) wins a free kick in the attacking half. Attempt missed. Craig Davies (Preston North End) right footed shot from outside the box is too high. Foul by Craig Davies (Preston North End). Corner, Carlisle United. Conceded by Tom Clarke. Substitution, Carlisle United. Liam Noble replaces Brad Potts. Attempt missed. David Amoo (Carlisle United) header from the centre of the box is too high. Jack King (Preston North End) is shown the yellow card. Craig Davies (Preston North End) wins a free kick in the defensive half. Foul by Paul Thirlwell (Carlisle United). Goal! Preston North End 4, Carlisle United 1. Craig Davies (Preston North End) right footed shot from the centre of the box to the high centre of the goal. Attempt saved. Craig Davies (Preston North End) right footed shot from the centre of the box is saved in the bottom right corner. Attempt missed. Tom Clarke (Preston North End) header from the centre of the box is close, but misses to the right.